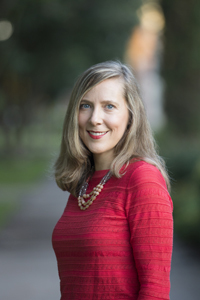 Baylor>Department of Religion>Our Faculty>Faculty>Natalie Carnes, Ph.D.
Natalie is a constructive theologian who reflects on traditional theological topics through somewhat less traditional themes, like images, iconoclasm, beauty, gender, and childhood. For this work, she draws on literary and visual works as sites of theological reflection, and her interest in doing so takes her into questions of religious knowledge and authority. What are the possibilities and limitations of different theological genres? In addition to authoring articles in Modern Theology, Journal of Religion, and Scottish Journal of Theology, among other journals, Natalie has written two books. The first is Beauty: A Theological Engagement With Gregory of Nyssa, and the second is titled Image and Presence: A Christological Reflection on Iconoclasm and Iconophilia. Currently, she is working on two new projects. One is a book with Matthew Whelan exploring questions at the intersections of poverty, aesthetics, luxury, and art. The other is a theological narrative contemplating children and childhood entitled Motherhood: A Confession. Natalie lives in Waco, her home for the last eight years, with her husband and three children. You can find a recent essay on beauty and affliction here, a blogpost on Confederate monuments here, and a blogpost on Rihanna dressed as a pope here. For more information on events, blogposts, and other writings, you can visit her website www.nataliecarnes.com. Systematic theology, Christology, theological anthropology, theological knowledge, theological aesthetics, images, iconoclasms, children, childhood, feminist theology, patristic theology. Motherhood: A Confession. Stanford, CA: Stanford University Press, forthcoming. Image and Presence: A Christological Reflection on Iconoclasm and Iconophilia. Stanford, CA: Stanford University Press, 2017. Beauty: A Theological Engagement with Gregory of Nyssa. Eugene, OR: Cascade Books, 2014. “How Love for the Image Cast Out Fear of it In Early Christianity.” Religions. Special issue on Platonism and Christianity. J. Warren Smith, ed. 8.20 (2017): 1-15. “Embracing Beauty in World of Affliction.” Republics of Letters: A Journal for the Study of Knowledge, Politics, and the Arts. Forum on Beauty and Form. Thomas Pfau and Vivasvan Soni, eds. 5.1 (January 2017): 1-14. "That Cross’s Children Which Our Crosses Are’: Imitatio Christi, Imitatio Crucis.” Scottish Journal of Theology 69.1 (January 2016): 63-80. “Receiving the Fragments of Balthasar: Critique and Community in Christian Theology.” Pro Ecclesia 24.4 (Fall 2015): 432-38. “We in Our Turmoil: Theological Anthropology Through Maria Montessori and the Lives of Children.” Journal of Religion 95.3 (July 2015): 318-336. “A Reconsideration of Religious Authority in Christian Theology,” The Heythrop Journal 55.3 (May 2014): 467-480. “Prelude to a Theology of Iconoclasm: Making, Breaking, Loving, and Hating Images.” LOGOS: A Journal of Catholic Thought and Culture 16.2 (Spring 2013): 15-32. “Possession and Dispossession: Wittgenstein, Cavell, and Gregory of Nyssa for Life Amidst Skepticism.” Modern Theology 29.1 (January 2013): 104-123. “The Mysteries of Our Existence: Estrangement and Theatricality.” Modern Theology 28.3 (July 2012): 402-22.